At the start of a New Year, a review of developments during the previous year makes an interesting read. 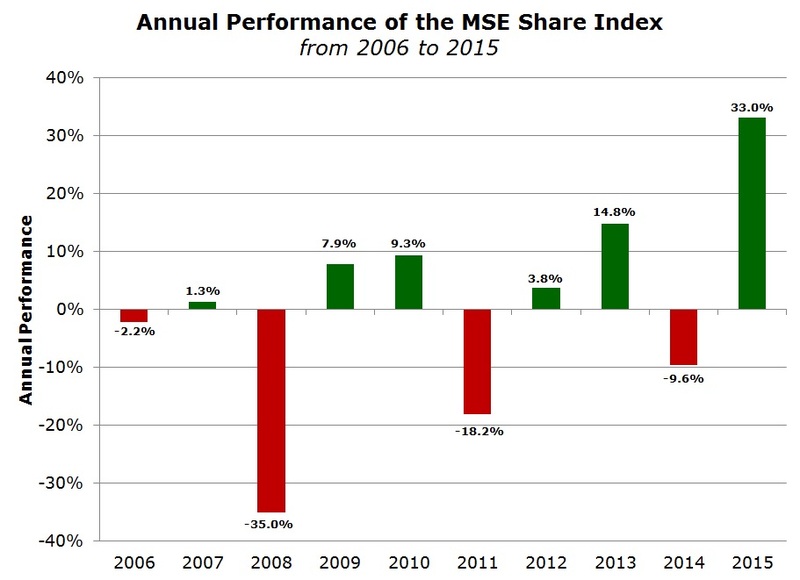 The MSE Share Index rallied by 33% during the past 12 months – the best performance since 2005. Trading volumes across the equity market surged by 60.5% over the previous year to €81.5 million. 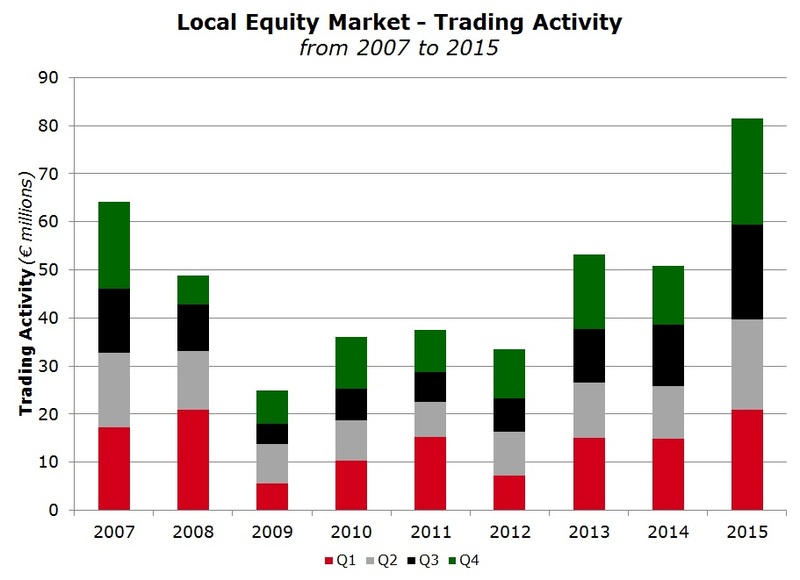 This is the highest level of turnover across the equity market since 2006. 2015 can best be described as a truly exceptional year for the Maltese equity market. This is not only due to the 33% gain in the MSE Share Index which is by far well above the performances of the main global equity markets including all the markets across the Eurozone with the exception of Latvia which posted an increase of 45.7%. In my view, 2015 is also extraordinary given the extent of the positive performances across most equities. Three companies saw their equities more than double in value during the past 12 months with a further 9 companies registering an increase of more than 40%. Among the 21 equities on the Official List of the Malta Stock Exchange, only one company performed negatively. This was GlobalCapital plc with a drop of 6%. The best performing equity during 2015 was Mapfre Middlesea plc with an increase of 131% to €2.30. Notwithstanding this extraordinary and unexpected increase, the equity is still well below its all-time high of €6.29 reached in May 2006. Since then the company suffered massive losses in Italy in 2008 and 2009. Although the 2014 financial statements published on 11 March 2015 showed a flat performance and dividends were unchanged, the share price of Mapfre Middlesea almost doubled in the first six months of the year. The positive equity performance continued during the summer months and this was justified by the 85% increase in profits announced by the Group during the first half of 2015. A most notable development at Mapfre during the year was the transfer of the general insurance business portfolio of Allcare Insurance Ltd for a consideration of €1.1 million. Until 21 December, Medserv plc ranked as the best performer as the equity was approaching the end of the year with a jump of 158%. However, the 16% decline during the final two sessions of the year in which the equity was active, pushed the equity into second place with a rise of 117% during the past 12 months. In the early part of 2015, Medserv’s share price performed positively in anticipation of the announcement of the 2014 financial statements. Following the publication of the 2014 financials on 3 March 2015 showing that pre-tax profits jumped to €3 million compared to the forecasts of €2.2 million and the declaration of a net dividend of €0.056 per share, the rally in the share price gathered further momentum. This continued during the rest of the year following various developments, namely (i) the publication of the Financial Analysis Summary on 15 May in which the company forecasted that pre-tax profits will rise by a further 43% to €4.3 million in 2015; (ii) the 2015 interim financial statements published on 27 August showing pre-tax profits surging to €4.5 million during the first half of the year and therefore having already exceeded the 12-month forecast; (iii) the publication of the Interim Directors’ Statement on 18 November revealing that the third quarter results of 2015 also exceeded budgets; and (iv) the announcement on 8 October of the intended acquisition of the METS companies in the Middle East for USD46 million. The company held two Extraordinary General Meetings during the year – the first in October in which shareholders authorised the Board of Directors to disclose price sensitive information to potential investors and the other EGM in early December in connection with the upcoming METS acquisition and the waiver of pre-emption rights. The downturn in the share price in the last few days in December materialised on 22 and 23 December immediately after the announcement of the 2 for 9 rights issue at a price of €1.50 per share. The major reason for the sharp decline was probably more to do with the ‘share overhang’ as the two Executive Directors decided not to take up the large majority of their rights. These shares, totaling 6.375 million, are available for subscription via an Intermediaries Offer at €1.50 as part of the dual issue currently taking place to raise the required funding for the METS acquisition. In each of the past 5 years, RS2 Software plc invariably ranked among the top positive performers which saw the company’s market capitalization rise exponentially from only €18 million in 2010 to a current €284 million. During the past twelve months, the share price of RS2 advanced by a further 116% – the third best performing equity in Malta. The equity was among the weaker performers during the first quarter of the year as investors awaited the publication of the 2014 financial statements. Although pre-tax profits edged marginally lower, dividends doubled and the share price started to move higher on the news. Moreover, in mid-May, the company announced a 2-for-1 share split and during the Annual General Meeting in June, the top executives confirmed that in addition to the licence agreement with a Vietnamese bank (announced a few weeks earlier), RS2 was also targeting other potential clients in Asia as well as in the US. The publication of the 2015 interim financial statements in mid-August continued to enhance the positive sentiment surrounding RS2. The company reported a 48.5% increase in revenue to €11.5 million during the first half of 2015 with pre-tax profits surging to €6.6 million – well above the profits ever achieved over a 12-month period. The share price continued to rally in November after the company reported that demand for the Group’s services remained significant during the second half of the year and besides increasing its implementation and service offering to its clients in Europe, Latin America and Asia Pacific, the Group also registered an increased interest from other regions such as the Middle East and Africa. RS2 also re-iterated its expansion plans in the United States and confirmed the very strong pipeline of potential business. The equity of Simonds Farsons Cisk plc was also on course to register an increase of more than 100% during 2015. However, the 5.8% decline in the share price in December trimmed the 12-month performance to +96.7%. The equity performed very positively during the first half of 2015 (+47%), and this upward trend continued during the second half of the year as the company detailed its plans for the €40 million development of the Farsons Business Park and confirmed its intention to spin-off its property subsidiary into a separate publicly traded company by mid-2017. Meanwhile, the core business performance remained very buoyant with pre-tax profits rising by a further 14.6% during the first half of their financial year to 31 July 2015. Although various other equities registered strong double-digit gains in 2015, one company in particular worth citing is Malta International Airport plc. The share price rallied by a further 71% to new record levels as the traffic results published on a monthly basis continued to reveal significant gains from one period to the next and more importantly, in February 2015, the company announced a 77.8% increase in the final dividend to shareholders for the 2014 financial year. 2016 could be another eventful year for MIA given the intended development plans announced recently and unconfirmed media reports on the new strategic partner of its largest client, Air Malta plc. After such extraordinary gains across most equities during the past 12 months, investors would be mistaken into expecting similar performances across the market during 2016. Important developments that are likely to impact investor sentiment in the coming months is news regarding the takeover of GO plc, as well as further details on the raising of fresh equity by the largest Maltese capitalised company, Bank of Valletta plc. Other company-specific developments such as plans at International Hotel Investments plc, news on the chosen investor by MIDI plc for the Manoel Island project, and the sale of the 49% shareholding of Lombard Bank Malta plc following the appointment in 2015 of an advisor to the special administrator in Cyprus should also impact sentiment and individual share performances. Moreover, following two takeovers and subsequent delistings that took place in 2015 (Crimsonwing plc and Island Hotels Group Holdings plc), one hopes that this trend will not continue as a result of the possible developments mentioned above or other probable takeover approaches. Retail and institutional investors need a wider choice of publicly listed investment opportunities to place the large amounts of idle deposits held across the banking system. Hopefully, other companies will go public on the Official List and possibly also obtain a listing on the new Exchange-regulated market PROSPECTS which should be launched by the MSE early this year. 2016 is therefore expected to be another exciting and eventful year for the investing community.